What is the cost of goods sold? How do we account for incomes and expenses related to inventory? And how does the cost of goods sold formula work? In this lesson we'll answer these questions and more. Whereas a service business provides a service, such as accounting, medical or repair work, a trading business trades in inventory (this means that it buys goods at a low price and sells them at a higher price). A trading business will also differ from a service business in terms of its income and expenses – i.e. the way a profit is made: whereas a service business renders services, a trading business makes sales. The income statement for a trading business will thus look different to the income statement of a service business. If you want to see what a basic income statement looks like for a service business and compare to the income statement above, or if you're just not familiar with this financial report, check out the lesson on the income statement. 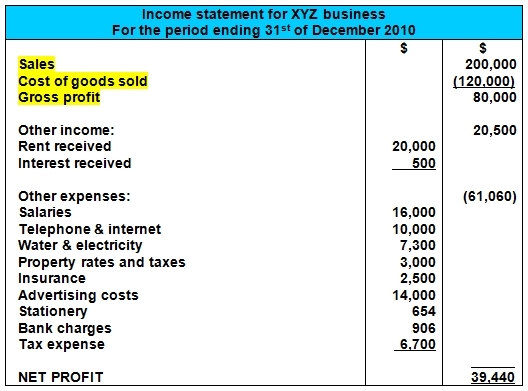 The income statement example above for a trading business is more complex than the simple one for a service business. This income statement is known as a multiple-step income statement, meaning that it contains more than one section or category for income or expenses. 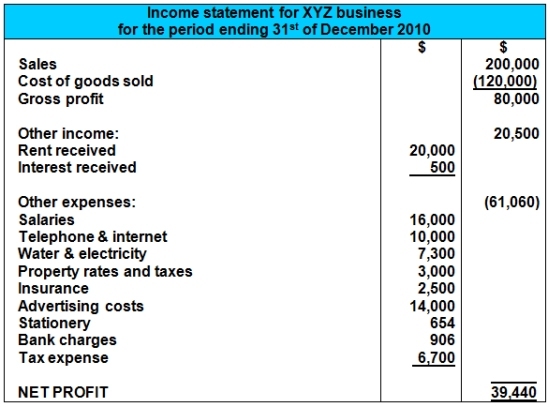 As you can see, the income statement for a trading business has a first section on its own. This first section describes its core activities, i.e. the buying and selling of goods. 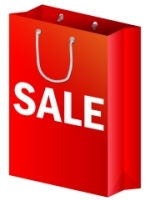 Sales are the full income for the year for selling goods. It is also sometimes called revenue or sales revenue. Cost of goods sold refers to the cost of all the goods that we sold this year. Cost of goods sold is commonly abbreviated as C.O.G.S. and is also known as cost of sales. 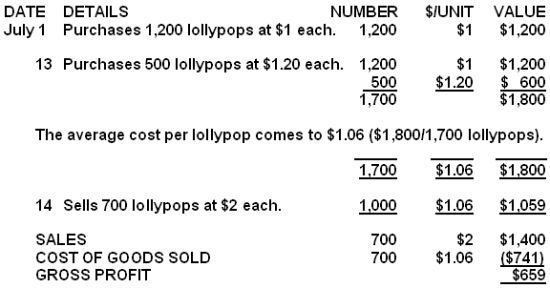 Cost of goods sold is an expense charged against sales to work out a gross profit (see definition below). So, for example, we may have sold 100 units this year at $4 each, and these 100 units that we sold cost us $3 each originally. So our sales would be $400 and our cost of the goods we sold (cost of sales) would amount to $300. This would result in a gross profit of $100 (sales minus cost of sales). Cost of Goods Sold does not include general expenses such as wages and salaries to office staff, advertising expenses, etc. It is simply the direct costs of the inventory that we have sold during the year. Please note that Cost of Goods Sold is actually not the exact same thing as purchases, as you will see from our examples further below. Gross profit is an initial profit on the product we are selling, before deducting general business expenses. Gross profit is calculated by taking the sales and deducting the cost of goods sold from this. The gross profit figure is seen as an indicator of how well a trading business is managing its core business of buying and selling goods. Okay, let’s do an example where we can work out the sales, cost of sales and the gross profit for a business. July 1	Purchases 1,200 sweets at $1 each. July	13	Purchases 500 sweets at $1.20 each. 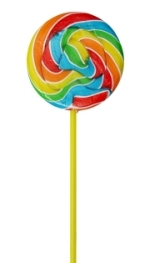 July	14	Sells 700 sweets at $2 each. How many sweets does she have at the end of the month? Okay, that's the quantity of her closing stock. As you can see, even though the purchases amounted to $1,800, the cost of goods sold (or cost of sales) amounted to $700. In this case, even though our purchases amounted to $1,800, our cost of goods sold (or cost of sales) amounted to $800. This is calculated as follows: (500 x $1.20) + (200 x $1.00) = $800. Again our purchases are $1,800, but this time our cost of sales comes to $741. Why am I showing you the different cost of goods sold figures? To illustrate that purchases and cost of goods sold, although related, are not the same thing. The formula just above is actually a very well-known formula in accounting. It is called the cost of goods sold formula (or the cost of sales formula). If you try the two formulas above using the figures from the table, you will see that they work every time. For example, with the FIFO figures, we can see that we had 0 inventories to start with, plus we purchased $1,800 worth of goods. Of these $1,800, we sold $700, so we were left with $1,100 closing inventories. Or, using the same figures, we can see that we purchased $1,800 worth of goods and were left with $1,100, so we must have sold $700 worth of goods (the cost of goods that we sold). Almost every accounting student I have encountered has had to memorize the cost of goods sold formula because they simply didn't understand what it means and how it works in practice. I hope the explanations above will make it easier for you to understand and work with this key formula. Then arrive at our net profit. There you go! I hope the Cost of Goods Sold Formula is now a lot easier, and that you have a better understanding of how sales, cost of sales, opening inventory, closing inventory and gross profit all fit together. You can find questions on these topics submitted by students around the world further below. If you're feeling good about this lesson, feel free to move on to the next one on Perpetual and Periodic Inventory. Return to What is Inventory? Why Show the Highest Cost of Goods Sold Amount? Cost Accounting - Fixed vs Variable?